Diane de Poitiers was born Sept. 3, 1499 in the château de Saint-Vallier, in the Rhône-Alpes region of France. At the age of 15, she married a man 39 years older, Louis de Brézé, seigneur d'Anet and had two daughters with him. Louis de Brézé died in 1531 in Anet (it's just beautiful, I can't wait to do a post o it), Diane took up black as her main colour of dress for the rest of her life, adding later some white and grey. Her shrewd knowledge in financial matters and legal issues became apparent after his death as she fought to retain her late husband’s title of "sénéchale de Normandie" which she accomplished. She was a wonderful hunter and sportswoman and it is recorded that she kept a very fit body and stunning good looks well into her late years. She was appointed to head the royal nursery. It is here that young eight year old Henri (son of Francois I) grew attached to Diane. Having lost his mother, Diane was his sole source of comfort and love. As the years progressed Henri fell madly in love Diane, nearly 20 years older than him . Henri was only 14 at the time and he made his devotion to the new widow clear.They were not lovers yet but this chivalrous admiration would grow into one of the most powerful love affairs of the age. In 1533 Henry was married to the daughter of a Florentine merchant, Catherine de Medici. Poor Catherine with her plan face could not hold a candle to the beautiful Diane de Poitiers or her bond with Henri. Diane would play a huge role in their marriage, overseeing their households, royal children and even state of affairs. Through it all Catherine smiled plotted, waiting for the right time to strike down her enemy. I had no idea but, Diane was actually Catherine's older cousin. 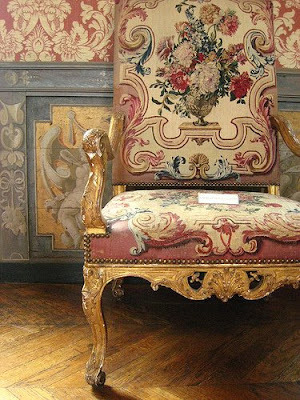 When Henri became Henri II, King of France Diane became his Queen in everything but name. 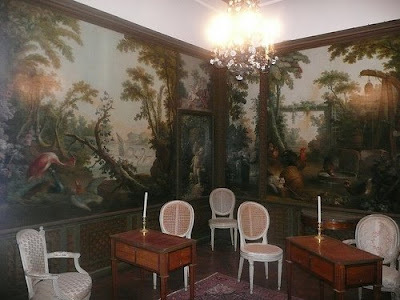 She encouraged him to visit his wife's bed because heirs were necessary and when Catherine became pregnant (she had 10 children with him), he resumed sharing his bed with only Diane. Everyone at court knew that Diane controlled the crown. 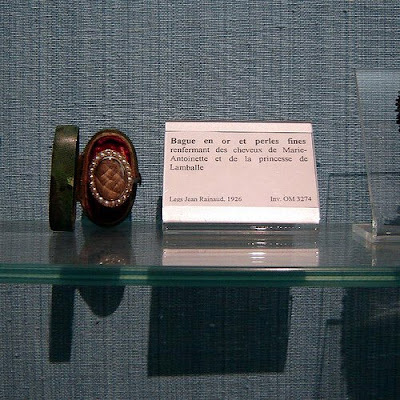 Diane had an extreme intellect and a political astuteness to the point that the King trusted her to write many of his official letters and they even signed them jointly with the one name: HenriDiane., when Pope Paul III sent the new Queen Catherine the "Golden Rose," he was sure to send the King's mistress a pearl necklace as well. Henry's monogram was a stylized 'H' and 'D'; governed his children, arranged the marriage between his son Francis and Mary Queen of Scots; and was entrusted with the Crown Jewels of France (oh dear, take the husband but at least leave poor Catherine the jewels!) 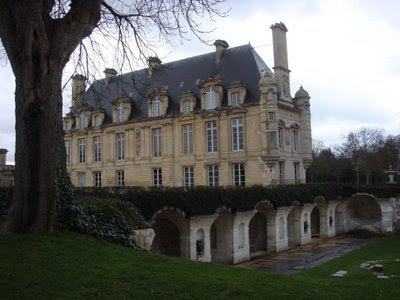 He had the Chateau d'Anet built for her, and gave her the Chateau at Chenonceaux, much to the horror of Catherine who had desperately wanted it for herself. Naturally, this did not sit well with the real Queen, who really loved her husband, and the two women hated each other beyond belief! In 1559, Henry was critically wounded in a jousting tournament and Catherine de Medici finally had a chance for her revenge. The king called out repeatedly for his love Diane and Catherine refused to allow her to see him. Upon his death, Diane was not allowed to the funeral. 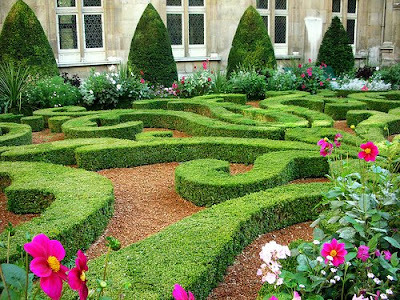 Immediately after, Catherine banished Diane from Chenonceaux to the Chateau Chaumont. She stayed there only a short time and lived out her remaining years in her chateau in Anet. She died on April 22, 1566 she was 67 years old. During the French Revolution, her tomb was opened and her remains thrown into a mass grave. 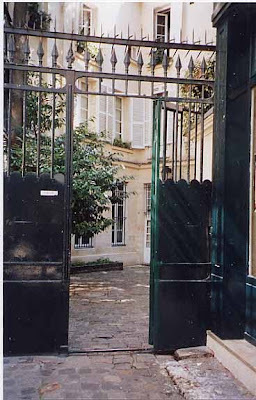 She had many residences this one in Cour de Rohn, located on the Rue de Jardinet, just off Boulevard St Germain-des-Pres. is still standing today. Have a wonderful day My friends, until tomorrow! 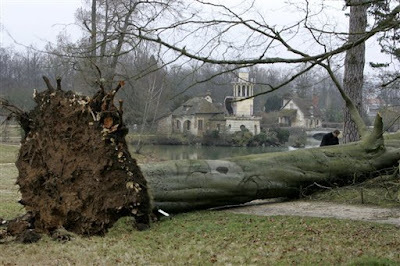 Marie Antoinette's tree in her treasured Hamlet has toppled from the severe storm that hit France and Spain. 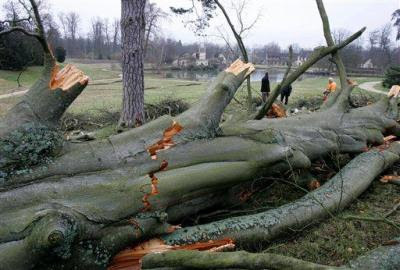 The tree survived the French Revolution, the years, and a devastating 1999 storm, but high winds have toppled a huge and ancient beech tree planted for Marie Antoinette over two centuries ago in the Versailles grounds. 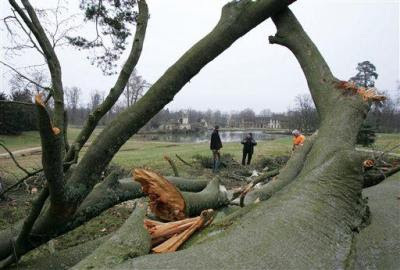 "Imagine how an old tree in Versailles is vulnerable to the wind," gardener Alain Baraton told AP Television News on Tuesday. "That was all it took to cause the tree to fall and crash." The 82-foot tall Purple Beech tree, one of the very last trees in the Queen's hamlet dedicated to her in the vast royal park, was felled Friday by a fierce winter gust. The 223-year-old tree's collapse exposed a jumble of roots, dirt and grass, was the latest victim to the Queen's Versailles vegetation after her most loved Oak tree died in a severe heat wave (in 2003). The beech(in case you love the Latin form: Facus Sylvatica Purpura) had its own plaque showing the year it was planted (1786). 10 years ago, it had been damaged but survived an even more destructive storm that knocked down thousands of trees at Versailles and devastated the grounds. Following that storm, the tree's roots had grown moldy and shrunk, they could no longer hold the weight. The beech will get an unceremonious and unroyal (however, Green)finish: It will be cut up and sold to paper makers. Just as I was finishing this post I saw a report that said at least 21 people died in the winter storm that hit France and Spain last week and my thoughts and prayers go out to those families. Much more important than a tree. I had no idea in my little corner of the world that it had been so severe. I hope people will be able to recoup their land, their crops, homes, etc. I love, love, love the Marais, it is one of my favorite places to roam about. 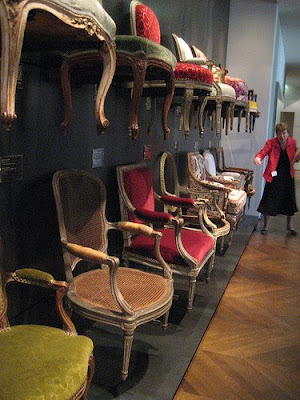 A great place there is the Musee Carnavalet. I always enjoy seeing the diverse items they have on display there and always great exhibitions. Here are some highlights. With all of the amazing museums packed into the city it's easy to overlook this one. Of course you go to the Louvre, the D'Orsay, etc. but this is a very nice way to spend the afternoon as well. 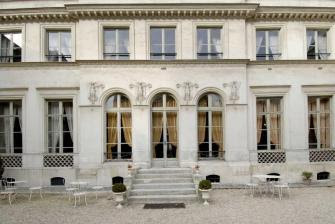 The Carnavalet Museum, is dedicated to the history of Paris, it is located near the Place de Vosges. 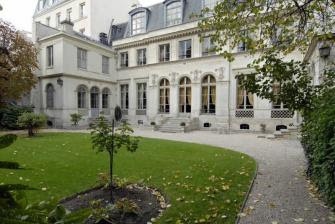 The museum is built around two adjoining mansions: the sixteenth-century hôtel Carnavalet and the seventeenth-century hôtel Le Peletier de Saint-Fargeau. 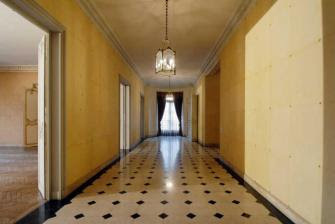 It contains over one-hundred rooms. 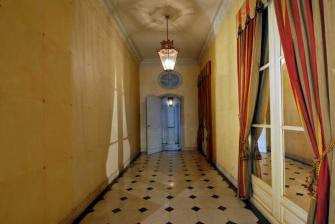 The Hôtel Carnavalet, after which the museum is named, was once the home of Madame de Sévigné, who wrote a series of famous letters to her daughter. 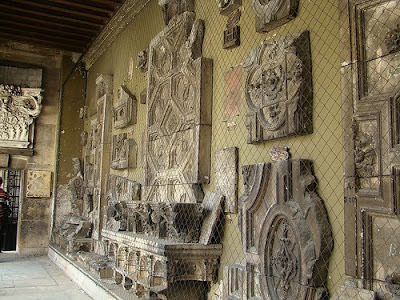 It now hosts the museum’s collections from pre-historical times to the reign of Louis XVI, while the Hôtel Le Peletier Saint-Fargeau contains pieces dating from the French Revolution to the present day. Could you just imagine all of us dressing up in our ball gowns, opera length gloves, diamonds and pearls, top hats, and tails! Oh to dream! Also there, a letter the little Dauphin was forced to write while being held captive (poor little thing), Marie Antoinette's shoes (which I posted in my last post). 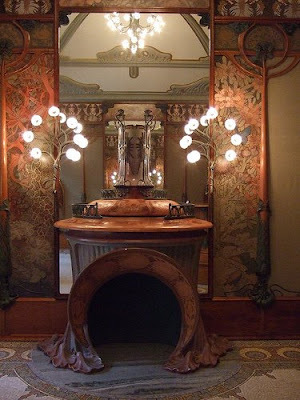 Also must sees are the salons and rooms of grand hotels that have long since disappeared. 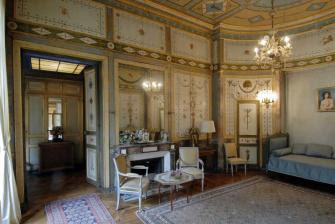 They are reproduced in every detail, the 19th century writer Marcel Proust's bedroom, a military tavern and a salon from the famous Cafe de Paris. 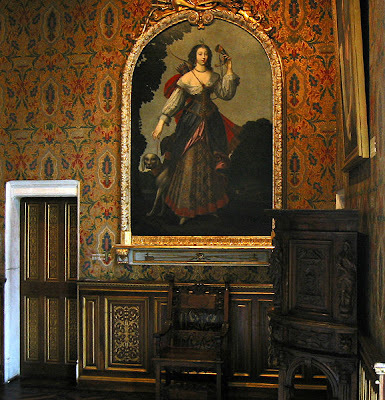 The famous painting of the doomed Queen Marie-Antoinette by A. Kucharski is also there, as are toys her children played with while in prison, as is some of the families furniture from the Tuileries that they used while being held there. However, just to see the buildings and petite garden are enough to entice a visit from me! I just love seeing how people lived before and to be in that environment, in a historical home (and such a grand one), it's pure heaven to me. Have a wonderful night my friends, until tomorrow! 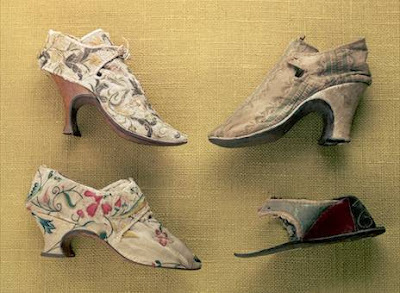 "The fashionable eighteenth century women's shoe was a luxurious and feminine accessory. 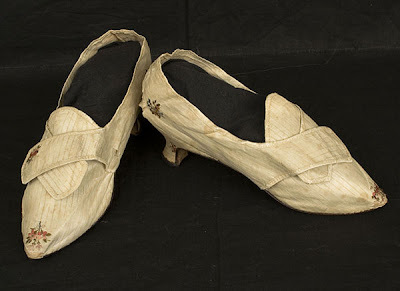 Ladies of quality wore shoes of rich dress silks which might, but did not necessarily, match their gowns. Made as "straights," that is without a designated left or right shoe." 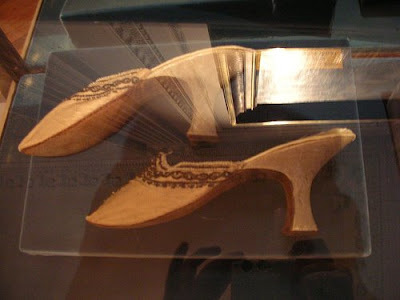 Men and women of the upper classes wore shaped high heels. 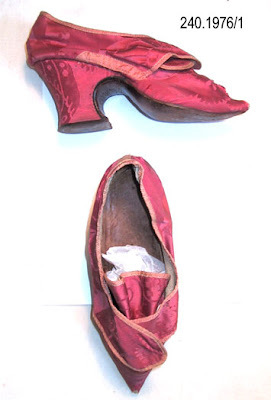 Materials for shoes were rich and splendid they included brocades, embroidered silks and painted leathers. Large showy buckles had become a significant feature of the shoes. Hello Friends! 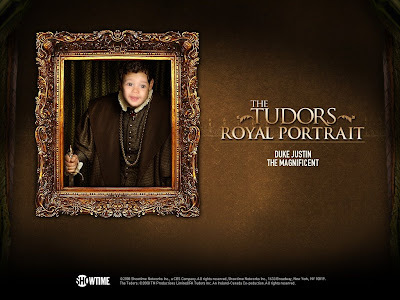 Okay, so I'm just wasting time today while my little Justin is taking his nap. I'm supposed to be cleaning and such, oh well, c'est la vie! 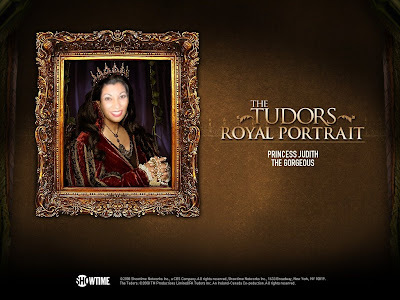 Like I say, I'm just wasting time and I love the show on Showtime The Tudors, so I went to their site to poke around (yes, I love all history not just French! :) and I found this hysterical photo section! I hope you have a good laugh...I know I did! 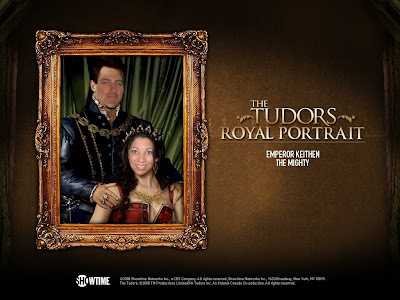 And...Here is what we look like as royalty! Justin or "Baby J" as his friends call him! Too funny, I just had to share! 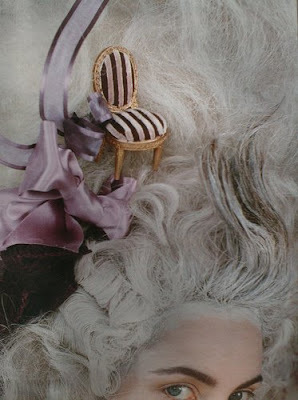 I just love the little chair both for my hair and my boudoir! Bonjour my Friends! I took my little one to Disneyland today and we are both exhausted! We had a very magical day riding the Pirates of the Caribbean, saying hello to Mickey and his friends, and braving the crowds. I have to say, my little Justin is already a ladies man...he had all of the princesses clamoring to take a photo with him! Mon Dieu! Too cute. I just wanted to post a huge thank you to all of my blogland friends. I have really come to look forward to sitting down at my computer in the evening with a cup of green tea and visiting all of these incredible blogs. Thank you all for your friendship and wonderful comments. When I started this blog in late October I had no idea that anybody would be interested in anything I had to say or write, little did I know I would meet some of the most eloquent and beautiful souls on here! So a BIG thank you and wonderful night to you all! 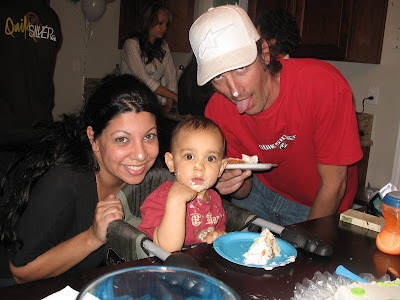 I have absolutely no idea where these pics are from (I'm sorry, I'm horrible at cataloging all of these photos) I just thought they were fun and whimsy just like our day with Mickey today! Bonjour my friends! I don't know if I've been cooped up too long (from being sick) or it's been so long since I've been back to France, or what, but I have an overwhelming desire to sell everything we have, pack up the family, and just move to France. I'm not kidding, I am seriously thinking about it! It's always been my dream to live there. When I was in college, I went to Paris to study for a semester through my school and I fell in love with the people, the culture, the beauty, the way of life. I didn't come home for three years (except for holidays and such). Then, I had to come home for family reasons and had the opportunity to go back 5 years ago with a great job opportunity but my Mother had just passed away and I just couldn't leave my Dad alone. 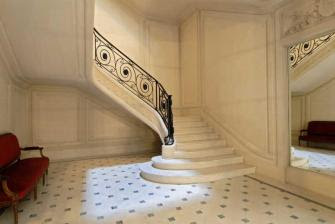 So, now what...I found this great place :) It's only a dream but what a lovely dream! 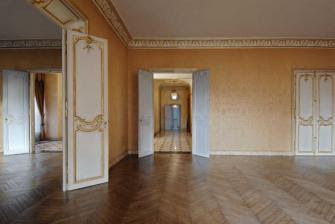 The floors are spectacular and the walls are amazing! 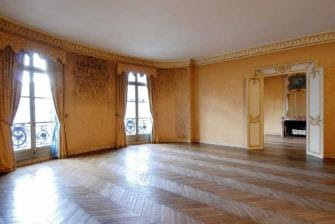 My mind is racing with all I can do to this room. Oh! The parties we could have here! Just imagine the ladies coming down in their ballgowns! That's it, I'm officially in love with this jewel! Hello Friends! I must apologize for being away so long! My whole little family has been under the weather, we've just been passing it back and forth. We are much, much better now, whew! It's been a rough week! Oh well, it's nice to be back in top form. As you must all know by now, I am in love with Versailles. It is grand, luxurious, over~the~top, and impressive to say the least. 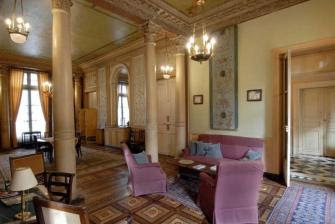 Strolling through the Grand Salons and the apartments of the Queen and King are awe inspiring but what interests me the most are the private apartments. To try to get a glimpse of the way they lived on a day to day basis, to see what life was really like, that to me is riveting! 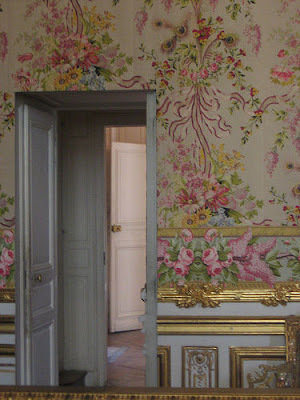 So, here is a small post on the private apartments of the last Queen of France, Marie~Antoinette. 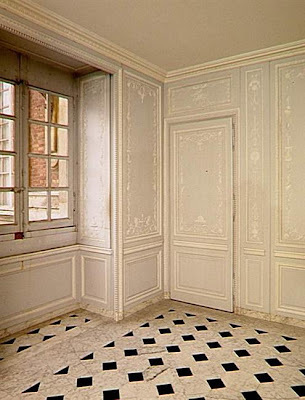 The petit appartement de la reine is a suite of rooms situated behind the grand appartement de la reine, and open onto two interior courtyards, this was the private domain of the Queens of France, Marie-Thérèse, Maria Leszczyńska, and Marie-Antoinette. 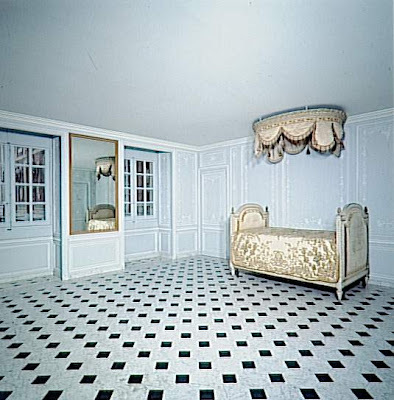 The rooms in the petit appartement de la reine have been restored to the state that they left when Marie-Antoinette left Versailles in October 1789. 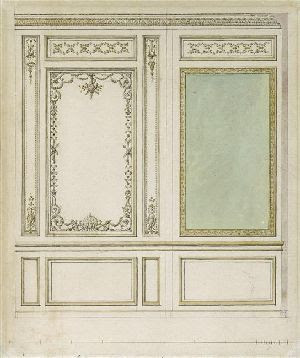 These several small rooms, which were built in the reign of Louis XV and then redecorated in a delicate neoclassical style for Marie Antoinette, consist of an antechamber, a salon where she sat for her Vigee-Lebrun portrait, a library, a bathroom (which had hot and cold running water and one of the few flush toilets in the palace) and an octagonal boudoir. 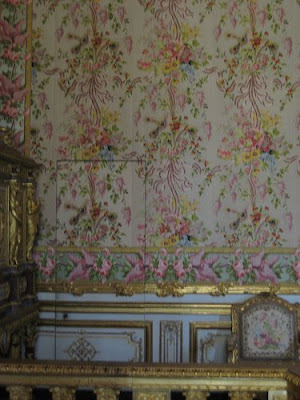 In these private apartments, Marie Antoinette and her friends enjoyed some happy times as they gossiped, sewed or listened to music away from the rigid etiquette and crowds of the public rooms. 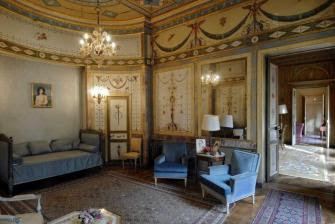 The rooms are small, and the ceilings more modest. 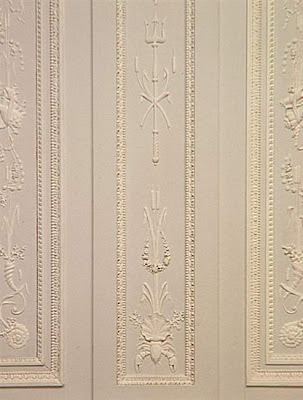 The furniture, paneling and wall hangings reflect a more delicate taste in fact, the Queen's own taste. 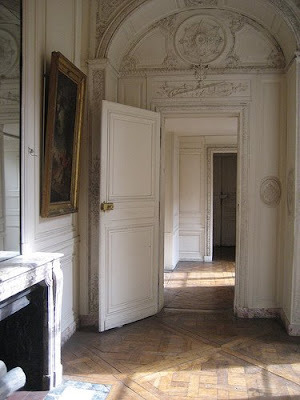 The above photos are of her Meridienne room. Here the Queen loved to lounge with her closest friends. Each day she would be brought books containing drawings of all of her dresses and other garments. She would indicate her preferences for the day by inserting a pin into the page that depicted the dress she wanted to wear. Later, baskets lined in satin would arrive with her selections. 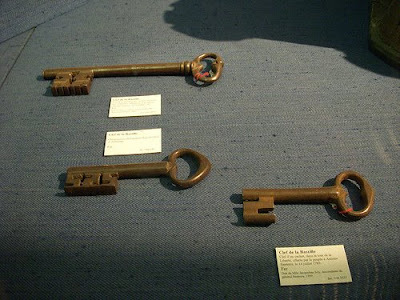 During the restoration of this room in the 1980s, the flooring was removed and a number of these pins were found. Apparently, pins had either been dropped or had fallen out of the books. 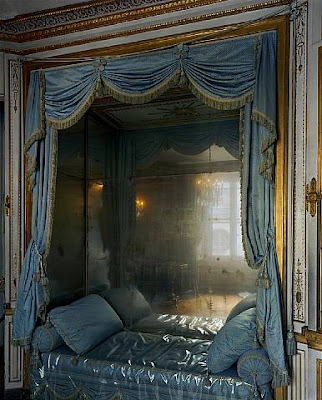 An eerie Legend has it that a young Marie~Antoinette rose from a nap on this bed and in the mirrored alcove thought she saw herself headless and shrieked with horror. I don't know if this story is true or not but it's easy to see that it could have happened looking at the way the mirrors are seamed in the photo. 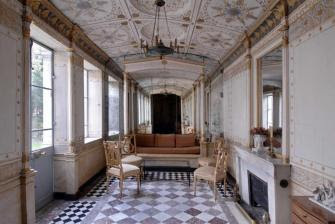 These rooms are so interesting and play such a large part in the way her history was played out. You can see her famous escape route for yourself: cut into the rear wall near the bed, is a partly concealed door. She most famously fled through here in the early days of the Revolution (October, 1789), as the mob entered the guardroom a few rooms away and massacred two of her guards. But before those final days at the palace, the little door was a portal to another life. 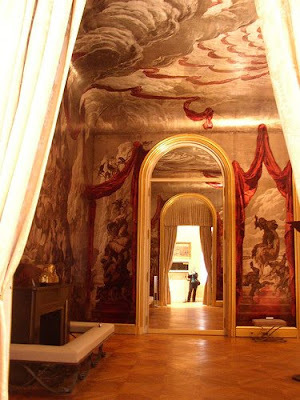 Through here is a treasure trove of private rooms and passageways: to the king's rooms, her private chambers, her children's rooms, and the attic rooms where the favorites had been housed in the past. Oh! How I would die to just be allowed to roam these areas! What a dream that would be. The bathroom is, I believe on the ground floor. 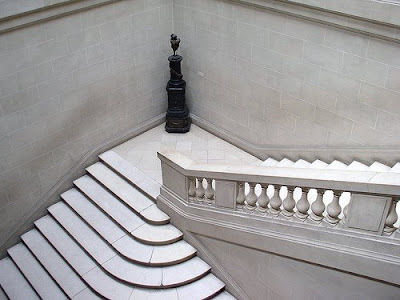 The Queen had to go through her "secret" door in her room, then directly to the left of that open door is another very narrow door (the doors are so close together that they will hit each other if one is not careful), then proceed down a stone, narrow stairway to reach this gem. Hardly the environment one envisions the queen stirring about in. 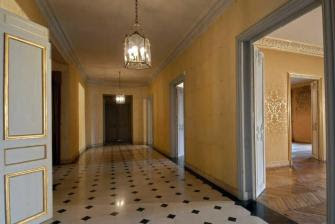 They very much look like the servants passages. 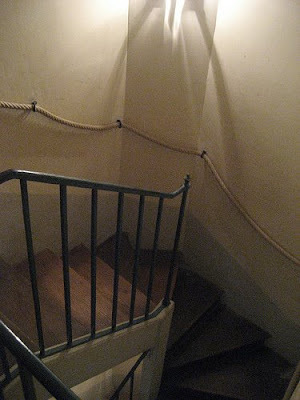 Not the staircase to the bathroom but her private staircase from her library leading to the family dining room (for those public meals she so hated). The bath in the bathroom is gone, but a raised rim in the black-and-white tiled floor shows where it would have been, it looks very tiny. 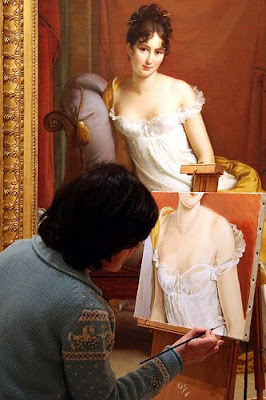 Marie~Antoinette is said to have taken two baths per day and did so in a muslin chemise (so as to not let her delicate skin touch the metal of the bath). She was very chic in that she was very clean, not a widely followed trend in this day. 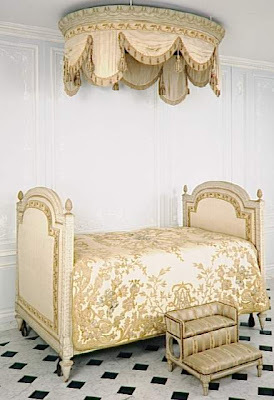 The only other objects in the room are a bed, a pair of the queen’s "scented" gloves and her travel chest. But what a chest it is, a hefty leather chest with jars, brushes, and vials. DOMAIN Design and the amazing Zelda! I Could Use Some New drapes! If These Walls Had Ears!